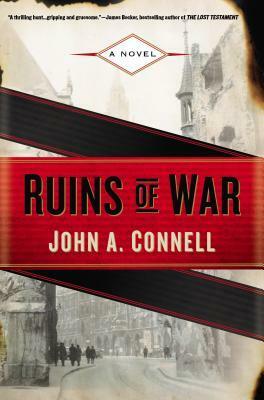 Berkley Publishing Group is thrilled to announce the publication of John A. Connell’s RUINS OF WAR (Berkley Hardcover; May 5, 2015; 978-0-425-27895-6; $26.95). An exciting debut thriller featuring a fascinating new character in Chief Warrant Officer Mason Collins—former Chicago homicide detective, U.S. soldier, prisoner of war, and now U.S. Army criminal investigator in the American Zone of Occupation in Munich. At a time when the worst horrors of the war are coming to light, there is another horror that is running rampant in the street. In the winter of 1945, seven months after the Nazi defeat, Munich is in ruins. The winter is brutal, the citizens are starving, and end of the war does not mean the end of the chaos in the city. Quite the contrary. It’s Mason’s job to enforce the law in a place where order has been obliterated. It’s a dangerous job, though it is a job he requested. And his job just became much more dangerous: a killer is stalking the devastated city. However, these are more than just murders; they are horrifying brutalities that begin to wreak terror on the already beleaguered citizens of Munich. This killer has knowledge of human anatomy, enacts mysterious rituals with his prey, and seems to pick victims at random. Relying on his wits and instincts while trying to work around the military-political blockades and hard-nosed commander, and trying to keep the memory of his past where it needs to stay, Mason must venture places where his own life is put at risk. From interrogation rooms with unrepentant Nazi war criminals to penetrating the U.S. Army’s own black market and working with an overeager American journalist, Mason must solve this heinous case before the killer strikes again. War-torn Germany was a hellhole. The nation had surrendered seven months before, but millions would continue to die. Disease, starvation, and winter’s icy embrace had replaced the bullets and bombs. And murder flourished in the ruins. Retribution, greed, mad­ness, jealousy, and desperation all fed a hungry beast. Murder happened every day, hundreds in a week, thousands in a month. Mason had been a reluctant guest of the German army from De­cember 1944 until liberated in mid- April. After a two- month stint in a hospital with typhoid fever and dysentery, he’d been offered a dis­charge. Much to the surprise and delight of the army staff, Mason had volunteered to stay on. He’d worked an interminable six months at a desk job at U. S. Army headquarters in Frankfurt before his re­quest to be transferred to the Criminal Investigation Division had fi­nally been accepted. And now, less than two weeks after he arrived in Munich, he’d landed his first homicide. It felt good to be back in the saddle. Maybe here, among these ruins, Mason could find a new begin­ning, regeneration in a festering wound. Manganella made another sharp turn, nearly throwing Mason into his lap. Mason was about to chew him out, when the corporal slammed on the brakes. Two U. S. Army military policemen held their hands high for them to stop. They stood in front of two jeeps parked to block the road. Four other MPs and two officers formed a wall that blocked Mason’s view of whatever was causing the screaming bedlam behind them. their chests. In the midst of the pandemonium emaciated children darted between sparring adults, taking boxes dropped during the fighting then disappearing into the gaps of the collapsed buildings. People emerged from what looked like a simple hole in the rubble with wine bottles or whole cases tucked in their arms. Some men stood among the fighters, paying no heed to their alcohol- fueled com­petitors as they smashed the neck of a bottle and downed as much wine as they could before throwing away the empty, and breaking the neck of the next. Corporal Manganella laughed at the spectacle, while off to Ma­son’s right a small group of journalists took notes or snapped pictures. One of the photographers caught Mason’s eye, an unexpected beauty among the beasts. She had a broad face framing a thin, upturned nose and stunning blue eyes. Her black hair was pulled back in an updo, victory- roll style, beneath a billed hat with the circular patch that identified her as a war correspondent sewn onto the crown. The jour­nalist snapped another picture while sporting a mischievous smile. She, like the rest, was having a field day reporting on the day’s version of chaos while the helpless MPs looked on. Mason climbed up onto one of the MP jeeps, which had a mounted thirty- caliber machine gun. He pulled back the charger and whirled it on the crowd. Mason fired a long burst above the heads of the crowd. The blasts from the machine gun were deafening. The bullets shattered brick and stone. There was no argument, no resuming the fight. Those who had been beating on their opponents a moment earlier were now helping them to their feet. They all began to disperse, women holding each other for support, drunken men staggering away, all leaving their once- prized booty on the ground or dropping it to the pavement with a crash. MP medics rushed in to take care of the injured sprawled on the wine- soaked pavement. “Who the hell is the moron on that machine gun?” someone yelled at the far left side of the street. A bull- sized MP master sergeant came running up, red faced with anger. The sergeant pointed at Mason.